California Governor Jerry Brown announced at his inauguration that Climate Change action would be prominent for his next 4 years of his administration. But all is not well in California with large public opposition to shale oil fracking championed by Governor Brown, and the state still being in the worst drought in 1,200 years exacerbated by high temperatures due to climate change. Fracking Opposition groups have adopted the slogan "Governor Brown: Climate Leaders Don't Frack"
Already California is on track to meet it's target of a third of electricity from renewable sources by 2020. Brown announced that this should increase to 50 per cent of electricity generation by 2030, plus a 50 per cent reduction in petroleum use in cars and trucks, and to double the efficiency of existing buildings, and use cleaner heating fuels. "And we must manage farm and rangelands, forests and wetlands so they can store carbon." said Governor Brown. He emphasised the enormous need for collaboration between scientists, engineers, entrepreneurs businesses and officials, "I envision a wide range of initiatives: more distributed power, expanded rooftop solar, micro-grids, an energy imbalance market, battery storage, the full integration of information technology and electrical distribution and millions of electric and low-carbon vehicles. How we achieve these goals and at what pace will take great thought and imagination mixed with pragmatic caution. It will require enormous innovation, research and investment." But under Jerry Brown fracking by Big Oil will continue in California. In fact, new reguulations for fracking in California have already been written, six months before the mandated scientific studies have been completed, according to environmental journalist Dan Bacher in this San Fransisco Bay Area Indymedia story. “California has essentially reversed the regulatory process when it comes to fracking,” said Jackie Pomeroy, spokesperson for CAFrackFacts. “State regulators have finalized California's fracking rules a full six months before any of the mandated scientific studies have been completed." Fracking is just a glimpse into the dark side of Brown's poor environmental record revealed by Dan Bacher. See his June 2013 article in CounterPunch: Jerry Brown: Worse Than Schwarzenegger on Environment?, and his September 2014 article: Big Oil’s Favorite Governor: Jerry Brown. Work by Professor Mark Z. Jacobson from Stanford University already shows that converting California's energy infrastructure to 100 per cent renewables is achieveable by 2050. Jacobson and colleagues show this is possible in their 2014 study published in the journal Energy - A roadmap for repowering California for all purposes with wind, water, and sunlight. (PDF). This study presents a roadmap for converting California's all-purpose (electricity, transportation, heating/cooling, and industry) energy infrastructure to one derived entirely from wind, water, and sunlight (WWS) generating electricity and electrolytic hydrogen. California's available WWS resources are first evaluated. A mix of WWS generators is then proposed to match projected 2050 electric power demand after all sectors have been electrified. The plan contemplates all new energy from WWS by 2020, 80-85% of existing energy converted by 2030, and 100% by 2050. Electrification plus modest efficiency measures may reduce California's end-use power demand ~44% and stabilize energy prices since WWS fuel costs are zero. Several methods discussed should help generation to match demand. A complete conversion in California by 2050 is estimated to create ~220,000 more 40-year jobs than lost, eliminate ~12,500 (3800 e23,200) state air-pollution premature mortalities/yr, avoid $103 (31-232) billion/yr in health costs, representing 4.9 (1.5-11.2)% of California's 2012 gross domestic product, and reduce California's 2050 global climate cost contribution by $48 billion/yr. The California air-pollution health plus global climate cost benefits from eliminating California emissions could equal the $1.1 trillion installation cost of 603 GW of new power needed for a 100% all-purpose WWS system within ~7 (4-14) years. But it is not all good news. Governor Brown has been heavily criticised by environment and climate groups for championing hydraulic fracturing (fracking) in California which utilises huge water resources while also threatening contamination and poisoning of water aquifers used for drinking water and for agriculture. 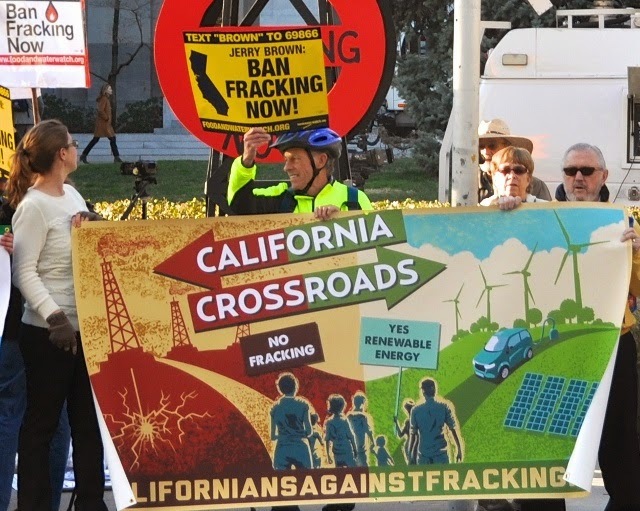 A March 2014 protest in Sacramento against fracking in California drew 4,000 people. The Centre for Biological Diversity is one of the enviromental organisations campaigning against Fracking in California. In October 2014 documents obtained through Freedom of Information by the Centre for Biological Diversity revealed that almost 3 billion gallons of fracking wastewater was dumped into Central California aquifers. The wastewater contains hazardous chemicals including Arsenic and Thallium. These water aquifers provide drinking water and water for agricultural irrigation in Central California. Testing by the State Water Board confirmed beyond doubt that at least nine wastewater disposal wells have been injecting waste into aquifers that contain high-quality water that is supposed to be protected under federal and state law. In November 2014 30,000 people urged Governor Brown to Halt Offshore Fracking with Two-thirds of California voters wanting a fracking moratorium, according to one opinion poll. On Saturday February 7th, 2015, thousands of Californians are expected to march through the streets of Oakland California, Governor Brown’s home city, protesting fracking, in a March for Real climate Leadership. One of the reasons fracking is so contentious is the use of huge water resources during the worst drought on record, and disposal of waste water illegally into ground water. Much of California's agricultural economy is built on irrigation using groundwater from aquifers. Contamination of these aquifers threatens drinking water and agriculture. New research published in December 2014 identified that this is the worst drought in California for the last 1,200 years. The study by Daniel Griffin and Kevin J. Anchukaitis is titled: How unusual is the 2012–2014 California drought? The scientists used tree ring data from blue oak trees from southern and central California as proxy measurments for environmental moisture changes. "California's old blue oaks are as close to nature's rain gauges as we get," said Daniel Griffin, an assistant professor in the Department of Geography, Environment and Society at the University of Minnesota "They thrive in some of California's driest environments." "We were genuinely surprised at the result," says Griffin, "This is California -drought happens. Time and again, the most common result in tree-ring studies is that drought episodes in the past were more extreme than those of more recent eras. This time, however, the result was different." While megadroughts have occurred in the past in California, the authors argue that the current short-term drought appears to be worse than any previous span of consecutive years of drought without reprieve due to the hotter temperatures. "Precipitation is not the whole story for California drought," said lead study author Daniel Griffin, "When we factor in temperature, this drought really stands out as an extreme and unprecedented case for the past 1,200 years." The research indicates that natural climate system variability is compounded by human-caused climate change and that "hot" droughts such as the current one are likely to occur again in the future. California is the world's 8th largest economy and the source of a substantial amount of U.S. produce. Surface water supply shortages there have impacts well beyond the state's borders. 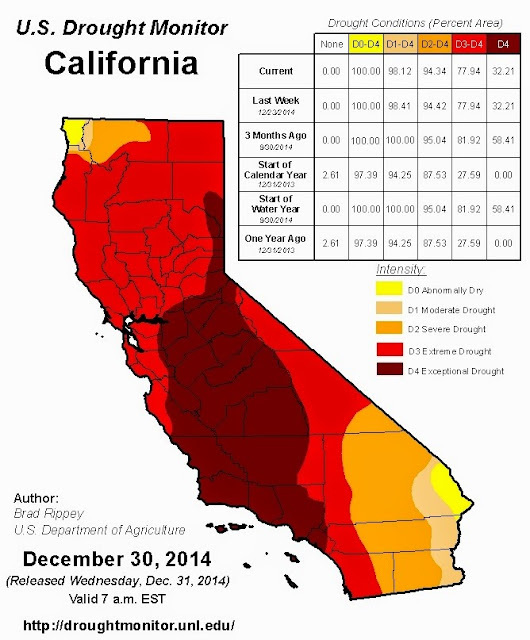 With an exceptionally wet winter, parts of California might emerge from the drought this year. "But there is no doubt," cautions Anchukaitis, "that we are entering a new era where human-wrought changes to the climate system will become important for determining the severity of droughts and their consequences for coupled human and natural systems." Meanwhile, Governor Brown continues to allow the oil and gas industry to waste 2 million gallons of fresh water a day on extreme oil extraction in California.